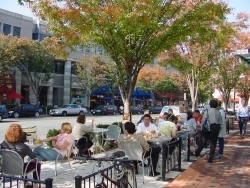 Check out the bustling food scene in Montgomery County, MD. From unique local restaurants, farm-to-table experiences, exceptional food trucks, remarkable breweries and wineries, exciting culinary news and moreLike us on Facebook, follow us on Twitter and share your thoughts and suggestions about your favorite place to dine, hang-out or socialize. What food or food-related establishment you would like to add to the already outstanding culinary offerings? Montgomery County government is pleased to announce a new program to support local restaurants that become green certified. The county is offering a one-time subsidy toward the cost to obtain a green restaurant certification through one of four third-party organizations. Restaurants are eligible for a subsidy of 50% of the certification fee up to a maximum of $1,000. As an added bonus restaurants certified by any of the certification programs will automatically become Montgomery County Certified Green Businesses and will be listed in the county’s Green Business Directory. Green certified businesses are also recognized in the county’s Central Vendor Registration System. Why Should Restaurants Consider Certification? Montgomery County is kicking off its new “Recipes for Success” program to help individuals planning to open a new restaurant or expand an existing restaurant navigate the County’s permitting and licensing process quickly and efficiently. “Recipes for Success” includes a free, pre-design consultation at which representatives from all county agencies involved in restaurant approvals will be available to explain the requirements to open or expand a restaurant. Montgomery County’s Department of Permitting Services is partnering with the departments of Economic Development, Liquor Control, Health and Human Services and Fire and Rescue Service, as well as the Washington Suburban Sanitary Commission. Every Tuesday, beginning November 4, prospective and existing restaurant owners will have an opportunity to meet with representatives from the departments at one time to review their plans and learn how to open or expand a restaurant in the county. The “Recipes for Success Welcome Packet” will be available at all county regional services centers or online. Business owners can also schedule a free pre-design consultation meeting by calling 311 or 240-777-0251 from outside the county. Or download the preliminary design consultation packet. Brewery Spotlight: Denizens Brewing Co.
Denizens Brewing Co. is Silver Spring’s first and only production brewery, taproom, and beer garden.